I have the distinction of being related by marriage to presidential candidate Noynoy Aquino; by blood and marriage to presidential candidate Gilbert C. Teodoro; and by blood to vice-presidential candidate Edu Manzano. First, everyone knows Noynoy is Peping’s nephew from his elder sister Cory; Noy is the only son of Ninoy, a national hero, and Cory, the mother of Philippine Democracy. Gilbert is the only child of former SSS administrator Gilberto de los Reyes Ortiz Teodoro and former Batasang Pambansa representative Atty. Mercedes “Ditas” Murphy Cojuangco-Teodoro. Edu is the son of the brother of my mother Adriano “Adi” Manzano y Hernandez and Nenita Barrios. I am truly proud to have them as my kin. And I am truly proud to have them as kin too. You have people that earned more than enough experience in the academe, charity works and government service to see themselves as qualified to run for higher office. In this case, I would analyze TingTing Cojuangco as the senatorial contender since the most recent elections proved that we would be seeing more of her as a public servant eventually. It was around the time when TingTing Cojuangco was campaigning as one of the senatorial candidates for the United Nationalist Alliance when the issue of the Philippine claim to the island of Sabah (formerly North Borneo) came up. She turned out to be one of the few reference persons for this topic. 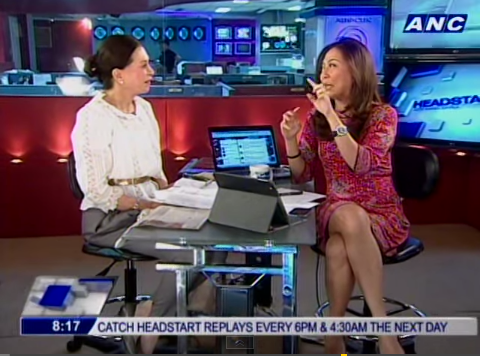 And it showed when she was interviewed on ANC’s Headstart with Karen Davila. How much has she learned way back when she was still writing her college thesis about Mindanao itself? It was in 1685 there was what was coming to a war between 2 cousins, Mudin and Muadin. And Muadin sought help from the Sultan of Sulu, Bakhtiar, then and this was in 1682. And so the Sultan of Sulu sent 5 ships and 6000 warriors and his mean killed Mudin. As a grateful gesture, Muadin gave North Borneo [now Sabah] to the Sultan of Sulu. Around this time, there was already confusion regarding the claimants as there were as many as 9 administrators. TingTing Cojuangco differentiated claimants from the administrators. Well they are not claimants. They are actually administrators. And this is in the Royal Court of Sabah. 9 went to the Royal Court because the Malaysians wanted to know “Are these claimants or not?” And so I did investigate the matter because Malaysia says they were claimants. Maybe they were the claimants in the eyes of the Malaysians. But in the eyes of the Philippines as Sultan, they were merely administrators. And one of them is who accepts the money. And so I’m told. But I’m also told in Manila that it is accepted by the Kiram family. Now, since she ran for public office, the voting public is watching as to whether TingTing Cojuangco would play it safe. She is after all the current president’s aunt-in-law. So having a relative speak out on whether you’re doing it right or not as head of state would get the public’s attention indeed. Before you know all the facts, don’t speak. And you know that, they should know that this is a historical perspective. It’s a cultural perspective, you know. It’s not all military might. This requires humanitarian delegates to visit them – understanding of who they really are and what they represent and what they want. You know what has been studied for decades and decades. 1685, you know, until the present and like I said you don’t just assume that you know it in a day. 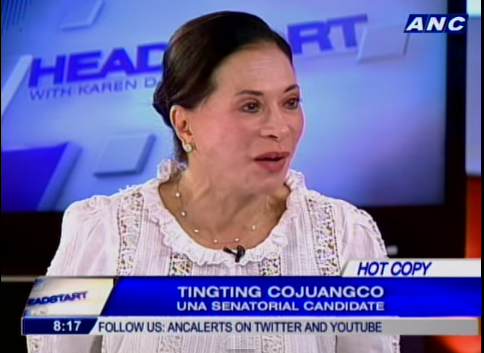 TingTing Cojuangco knows what she’s talking about. She even knew the legal bases that would cover the claims surrounding Sabah. Territories acquired and colonies are mentioned. Well there is the International Court. But there is also the 1947 UN Charter that states how acquired territories should now be given their freedom. 1947 UN Charter and another one is 1950. I say acquired only on the sense the occupancy is now Malaysian with Filipinos. But what really concerns me is that you know, kawawa these madi-deport. We already have 5 million Filipinos out of jobs [as of 2013 at the time of this episode’s airing]. You know there are 900 or 850 Filipinos in Sabah. You know if the Malaysian government gets mad at all that is happening – well, obviously they’re mad, … – and then the question is “Is this terrorism or is this war?” Okay. And then that has to be received by Malacanang, you know. They have to know this. They all come from Tawi-Twi or into Sulu and Basilan. This is a national security problem. And it leads to my tagline: “Una sa Lahat, Safe Kayo”. How safe can you be? Poverty, joblessness, no food, no livelihood and separated families. As much as TingTing Cojuangco turned out to be one of the best resources today when it comes to solutions that are applicable to Mindanao today, some of her most prominent accomplishments come from being governor of Tarlac for 2 terms. Details were shared in an interview she granted to GMA Network’s “Powerhouse” by Kara David. I took care of the farmers. I increased the yield kasi nung ako ang nag-assume, it [pertaining to the production] was only 80 cavans per hectare. But after the years, it became 150 cavans per hectare with additional fertilizers, additional seedlings, water system and farm-to-market roads. This is where TingTing Cojuangco gave her comments regarding the current agrarian reform system in Hacienda Luisita as one who used to take over the operations and as one who saw what else needs to be improved for the sake of quality public service. The government should support the farmers. You don’t give them the land and leave them alone. But what has happened to land reform is that they’ve taken it only in giving away land, not a comprehensive agrarian reform. And that’s what we’re saying. I give out a lot of land titles as governor but we have to support them. As of this writing, TingTing Cojuangco is a registered voter of Maguindanao, an effort seen as a move towards taking her brand of public service to Mindanao to help in any way she could to keep the peace talks running. With the linkages she has established in the area, she published several books with some of the original copies found in her library at her Makati home. What started out as an academic approach to make her mark in the world eventually became an advocacy. Both inteviews – the one from ANC and the one from GMA News – turned out to be gold mines of information about TingTing Cojuangco. For a personality that was initially known as one of the 100 Most Beautiful Faces in the World according to Harper’s Bazaar during the 60’s, TingTing Cojuangco has really gone a long way indeed. Exploring the family tree had never been this interesting. This must have been one of the first things TingTing Cojuangco herself felt when she wrote that detailed genealogy on her Philippine Star article. And I see myself writing more about them too. You get to see them too a lot earlier than others the moment you liked my official Facebook page, Kuya Manzano Fan Club, and followed me on Twitter @kuyamanzano. Gracias!